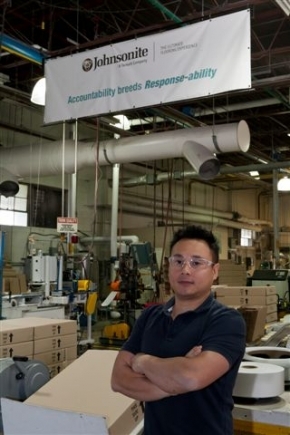 Johnsonite Canada’s health and safety coordinator Hugh Le is the 2011 Safety Leader of the Year — the story of how one man has inspired a company to strive for world-class safety excellence and what it is doing to achieve that goal. When Hugh Le was hired by Johnsonite Canada nearly five years ago — as the company’s first full-time health, safety and environmental coordinator — he was bent on pursuing a path of safety excellence at the organization. But he had to start from scratch. First on his to-do list was creating a health and safety manual for all Johnsonite Canada employees. Although some policies and procedures already existed then, those previous versions were unsystematic and “all over the place,” Le says. Centralizing the health and safety policy company-wide was essential for building the ideal safety culture Le wants to cultivate among employees — so was gaining the trust of both workers and management team. Le looks after the health and safety of all 65 workers at Johnsonite Canada’s Waterloo, Ont., site, which is part of the global Tarkett group of companies. From the beginning, he made a commitment to be available to employees all the time, which means he is on-call 24/7. Johnsonite’s manufacturing operations run a continental shift schedule, seven days a week. “In order to be able to have support for the night shift, I come in at 7 [in the morning], instead of 8, so that I can follow up with the night shift to see if there was anything they needed or if there was any safety items or any support they needed,” Le tells Canadian Occupational Safety. Any issues brought up by the night shift are discussed at the daily morning safety meetings — whether it was a near-miss incident, any unsafe conditions or tasks. Johnsonite has a full health and safety committee, with two safety representatives in each shift. A lot has changed in worker attitude and in the company’s overall safety performance since Le came along, according to Scott Lackenbauer, operations manager and controller at Johnsonite Canada. “Le has done an excellent job with our safety,” says Lackenbauer, noting that Le has led its health and safety team when Johnsonite launched its “world-class manufacturing” initiative. The company has now gone four years without a lost-time incident, an accomplishment that’s been recognized through several awards from the Excellence in Manufacturing Consortium — the country’s largest consortium of Canadian manufacturers. The company was so impressed at Le’s performance as its health and safety leader that Lackenbauer took it upon himself to nominate Le for the Safety Leader of the Year Award. If there’s one trait of Le that has allowed him to achieve his health and safety goals, it’s his ability to wear multiple hats, says Lackenbauer. He is very sociable and can relate to different levels of personalities at the company. As the main go-to person for all things related to occupational health and safety — including workers’ compensation, return-to-work management, health and safety, WHMIS — Le says it helps to have a very flexible attitude and passion for the job. Le has an educational background in mechanical engineering technology, industrial engineering, occupational health and safety and machine guarding, and is in the process of obtaining his CRSP certification — an ideal combination for a jobsite that uses various types of machinery and poses huge potential for injury. Johnsonite Canada manufactures wall base for commercial applications. As a result, associates on the floor trust Le to look out for their safety on the job, making it easier for him to get their support on various initiatives designed to improve health and safety at Johnsonite. Le has also shown effectiveness in working with the management team and getting its support for his OHS initiatives — and that’s because he does his homework quite well, Lackenbauer says. Over the last four years, Johnsonite Canada has gone more than 1,600 days without a lost-time incident — quite an achievement for a facility that runs on a 24-hour shifting cycle. A big contributor to this success is the company’s well-established return-to-work program and system of tracking and measuring targets, Le says. Working towards a target of zero incidents, Johnsonite uses key performance indicators (KPI) — or goals— and key action items (KAI) to help them achieve those goals. These goals and the action items are consistently tracked and communicated—through meetings, newsletters and postings. Tracking these KPIs and KAIs also allows Le’s team to look at some issues that are trending—for example, increased incidents of cuts or unusually high reports on fatigue or heat stress incidents — and turn that into a hot topic. “We will take that hot topic and work on that for the next following month to try to eliminate or reduce that. And once it is reduced, then we look at the next hot topic,” Le explains. The dramatic improvement in the company’s safety culture is a big factor that allowed Johnsonite’s safety team to easily track and have a good handle on the company’s OHS performance. Increased incident reporting allows the company to continuously improve safety. It’s a mindset that comes with a maturing safety culture. His work towards promoting safety at Johnsonite not only earned him the respect and support of the workers and management at the Waterloo facility, but also the recognition of Johnsonite’s parent company, Tarkett Group. In fact, Le recently flew to Paris — where Tarkett’s headquarters is located — to receive an award recognizing him for his safety achievements at Johnsonite Canada. Johnsonite Canada is working towards achieving “world-class safety excellence” status, according to Le. The company’s effective return-to-work program has reduced its WSIB claims significantly, and it’s well on its way to going five full years without any lost-time incident. Le also intends to spread the word on safety beyond the walls of Johnsonite Canada. He wants to educate more people about the importance of safety practices. Pursuing a degree in occupational health and safety is part of his future plans, so is becoming a safety advocate outside of work.